It's the last day of this August month and time to say Goodbye to August 2018 on Koh Samui. To start with the weather during this August. It wasn't that great. Plenty of rain and cloudy skies in the beginning of the month, easily holding on to the middle of this month. You can also include some stormy day in there as well. The last week of this month was a lot better. During this last week of August the sun came out and it was immediately hot around the island. Today it's partially cloudy with the sun peeking through and a current temperature of 31C at 11.30am. All in all not your best or dream August. It looks like next month, It looks like September 2018 is shaping up a lot nicer. Time to move on though and embrace September 2018 into our arms..
Sunday afternoon and here it is, the Koh Samui, Thailand weekly weather update; 20th August – 26th August 2018. It's been cloudy all day long and it's currently 30C at 2pm. It looks like it will stay cloudy and dry for the rest of the day. The previous week was slowly getting into August shape again. Towards the end of the week it was partially cloudy. Temperatures rose immediately and it was hot. We had temperatures ranging between 28C and 32C but it felt a lo warmer at times. 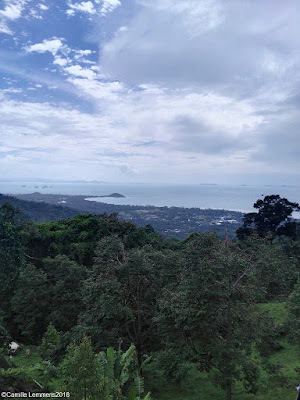 Koh Samui, Thailand weekly weather update; 20th August – 26th August 2018; View from top of the hill at Lip Yai, where there is a restaurant. The view is over Lipa Noi. You can see Lipa Noi beach all the way down to the Navy base. For next week it's looking dry for a change and hopefully we can leave this August behind us with a few nice days. It will be partially cloudy at best but dry for next week. More sunshine may turn up next weekend, at the start of September. 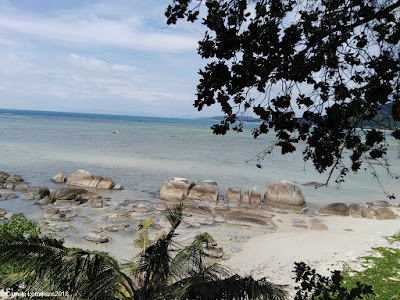 Sunday morning and time for the Koh Samui, Thailand weekly weather update; 13th August – 19th August 2018. Another week of being injured and no running. Clocking on four weeks now but I still keep myself busy with indoor cycling and other forms of cross training. Think planking, weight training etc. On to the weather though, it's cloudy over Koh Samui this morning and the current temperature at 10am is 31C The sun may pop out later today and there's nice breeze. Koh Samui, Thailand weekly weather update; 13th August – 19th August 2018; View over Lamai bay. One fo the first people I met during my early visits to Thailand, in the mid nineties, was visiting Koh Samui and we met up. It was nice to meet him and his family and this is the place they rented via Airbnb. With a great view over Lamai bay. A three story house with 4 bed rooms and separate bath rooms. Lovely! For next week we may have some more sunshine and few showers but they rain has not completely gone! The wind has slowed down to a nice breeze. Maybe a little bit closer to what one can expect during an average August. Nonetheless, if you're on the island, enjoy your stay and go out. See places, meet people and be safe whilst driving a car or especially a motorbike. 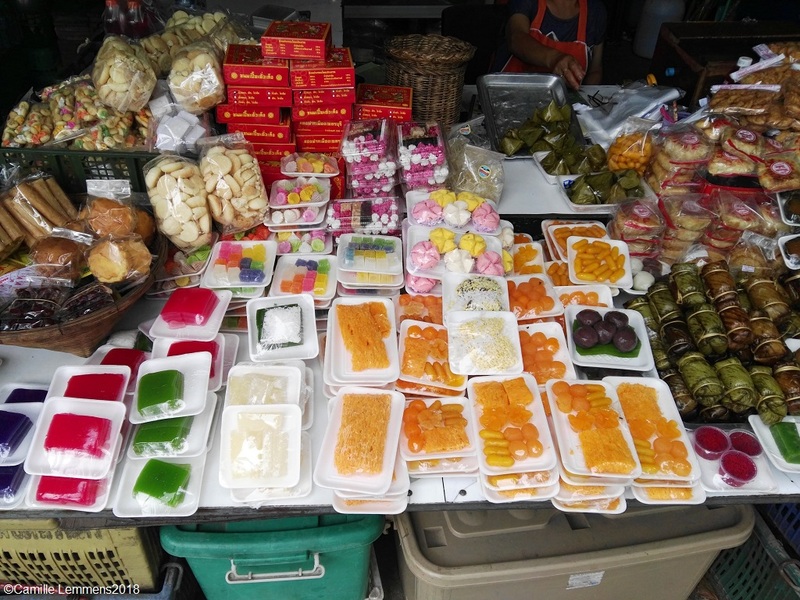 Sunday morning and time for the Koh Samui, Thailand weekly weather update; 6th August – 12th August 2018. We're on the way back home from Don Sak to Koh Samui after having visited a funeral wake yesterday on the mainland near Surat Thani city. On Koh Samui it looks grey with plenty of cloud cover. No rain or marginal rain is expected today. Current temperature at 11am is 29C. 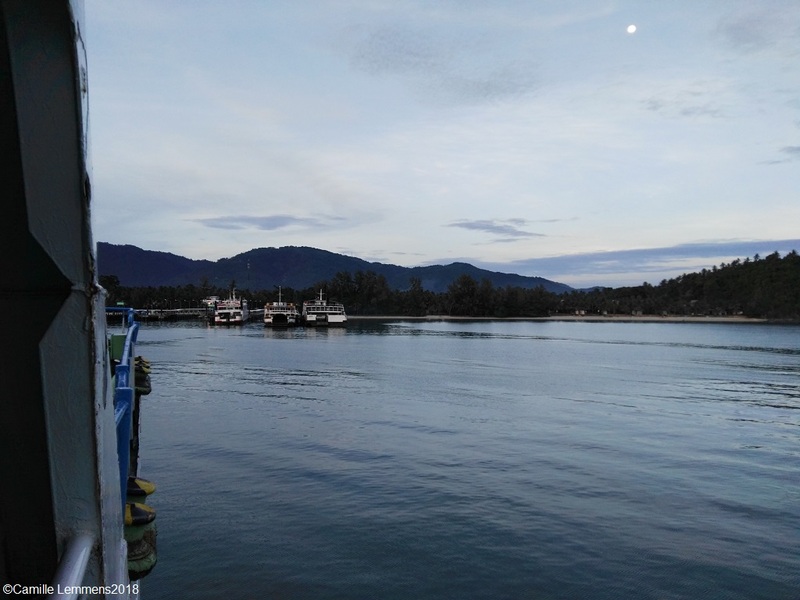 Koh Samui, Thailand weekly weather update; 6th August – 12th August 2018; View at the Raja Ferry pier at Lipa Noi. On the way there again, left Don Sak at 10.12 with the 10am ferry. Service at Raja is abysmal, ferries are notoriously late and slow. Comfort levels are low on old and mostly outdated ferries. I prefer the Seatran ferry but sometimes circumstances dictate a Raja ferry sailing. Not something to look forward to. Bottom line is that they don't seem to care about their customers. Since they started the Don Sak - Koh Samui service in 1981. Last week saw a mix of hard wind, plenty of rain and occasional sunshine. Maximum temperatures ranged between 24C and 33C. So far it's not the August that you would hope and expect on Koh Samui. For next week the forecast predicts hard wind today and tomorrow. The strong wind declines each day until Thursday. Come Friday the wind may pick up again. Besides a few isolated showers or thunderstorms throughout the week, some more rain is possible over next weekend. It's late in the evening and with being busy at work, I almost forgot it but it's Sunday and time for Koh Samui, Thailand weekly weather update; 30th July – 5th August 2018. No running today, but I hope to start that again tomorrow. Instead I have been diving at Panagsama beach near Moalboal on Cebu island in the Philippines. See a picture below. On Koh Samui it was cloudy today with some rain showers and a max temperature of 33C. Now in the evening at 9.30pm it's 28C. In Moalboal in the Philippines we're part of the yearly monsoon and the last 3 days it was cloudy, windy and at times with rain. Maximum temperature today reached 29C. 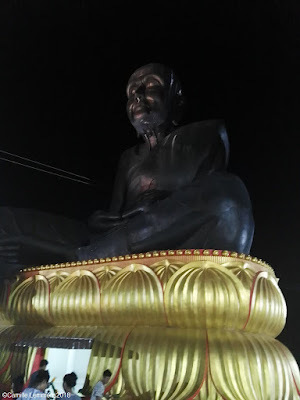 Koh Samui, Thailand weekly weather update; 30th July – 5th August 2018; The sitting monk statue at Wat Bophud or Wat Bo Phuttaram, during the evening. Last week some a mix of partially cloudy days. Sometimes it stayed dry and sometimes there were some showers. A few times the wind played up a bit as well. Maximum temperatures ranged between 33C during the daytime and 25C at night. Koh Samui, Thailand weekly weather update; 30th July – 5th August 2018; A clown frog fish as spotted yesterday. This was found on the house reef of PADI 5* IDC center 'Neptune Diving Adventures' at Panagsama beach, near Moalboal in the Philippines. For next week there's still lots of cloud cover predicted an it looks like a lot of tropical showers. The wind may also be picking up in speed and power, until Wednesday. Mostly during the night or the early morning though. 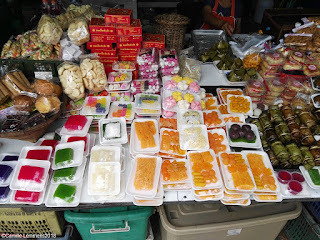 If you find yourself on Koh Samui during next week, don't forget to check out some of my recommendations, listed below. In general, do enjoy your time here! It's a new day, it's a new dawn, it's a new life, ah, well, it's for sure a new month so Welcome to August 2018. The last three versions of August were not what you expect in August. They were windy and had lots of rain. Four years ago it was more like, nice and sunny. Let's hope this years version is a good one although the start is not promising. Strong wind with plenty of rain is predicted. This morning looks glorious though, with the sun on the rise and no clouds around. At 6.30am it's 25C, nice and cool. Be ready for a hot one though and get that sun lotion out. 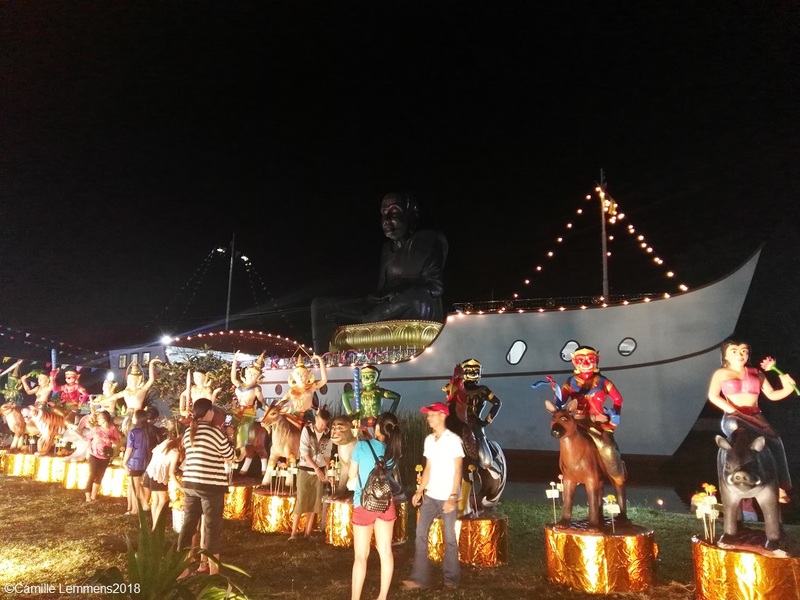 Welcome to August 2018; During the recent temple party at Wat Bo Phuttharam or the Bophud temple at the traffic lights near Fisherman's Village, the new, small statues had been rearranged and are now in front of the big sitting monk statue. August is a typical high season month for Koh Samui, with all the European countries having holidays. It will be busy all around so let's hope for more sunshine! There are no big events happening that I know of, this month. In a weeks time I will be back home, from the Philippines and come 26th August, I will run the Khanom half marathon. Khanom is directly opposite Koh Samui, on the mainland. Enjoy your stay on Koh Samui this month and fon't hesitate to check out the trips I offe or the dinner option with the Thai Experience.